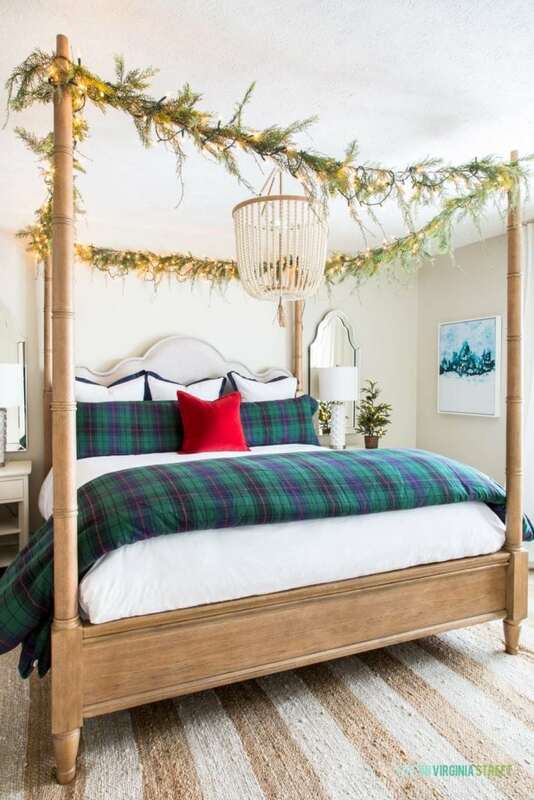 Welcome to part II of my plaid Christmas home tour! 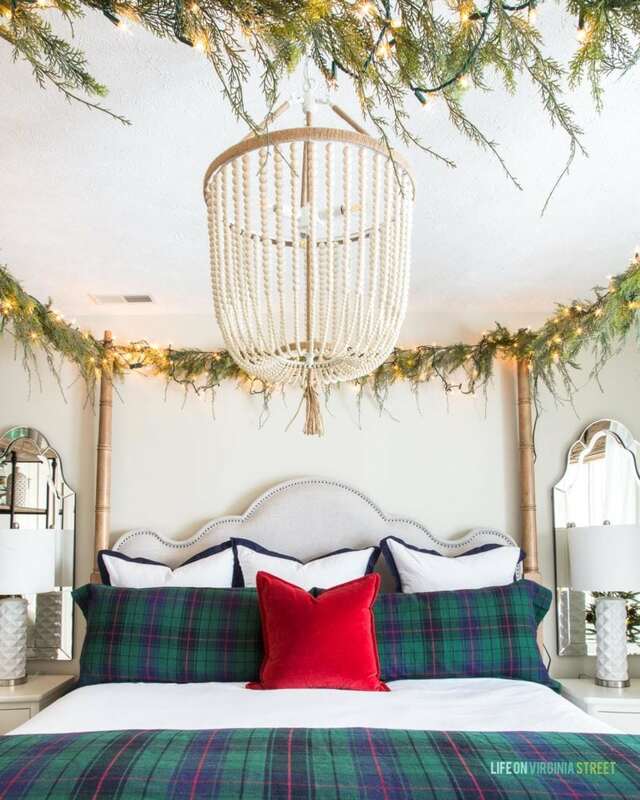 Be sure to check out the first part of my plaid Christmas home tour if you haven’t already because I’m sharing all new spaces today. 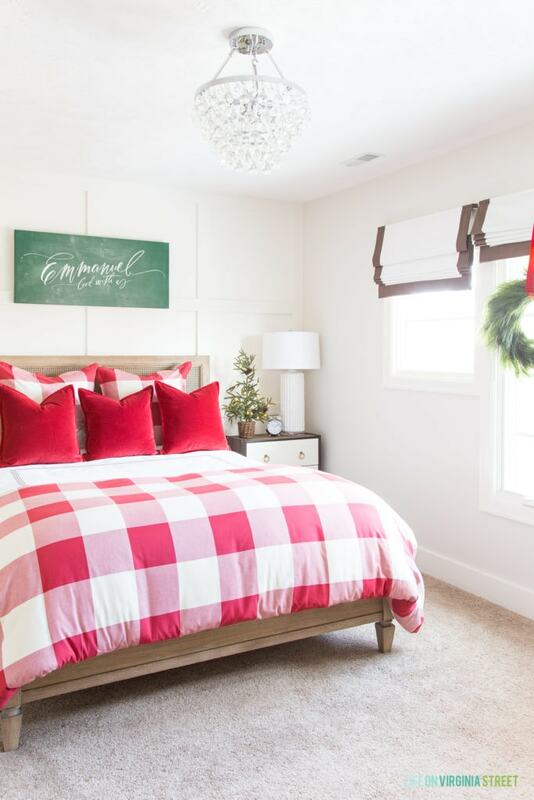 Today I’ve teamed up with some super talented friends as part of the Simply Christmas Home Tour to share various rooms in our homes all dressed up for the holidays! If you’re stopping in from Randi Garrett Design, welcome! 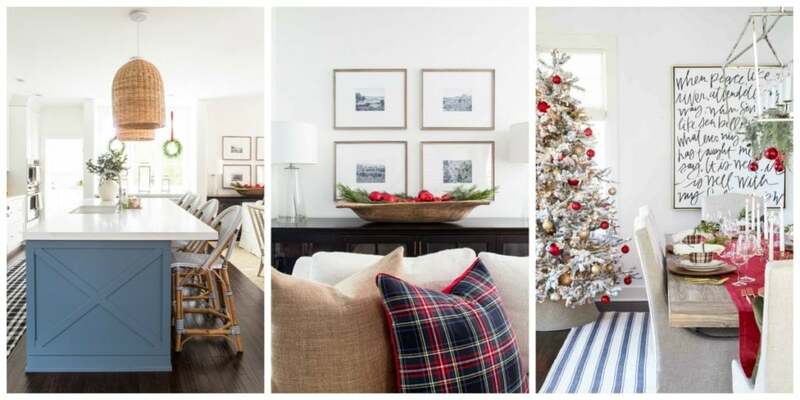 Randi’s homes is one of the most beautiful I’ve ever seen, and it looks even more stunning for the holidays! 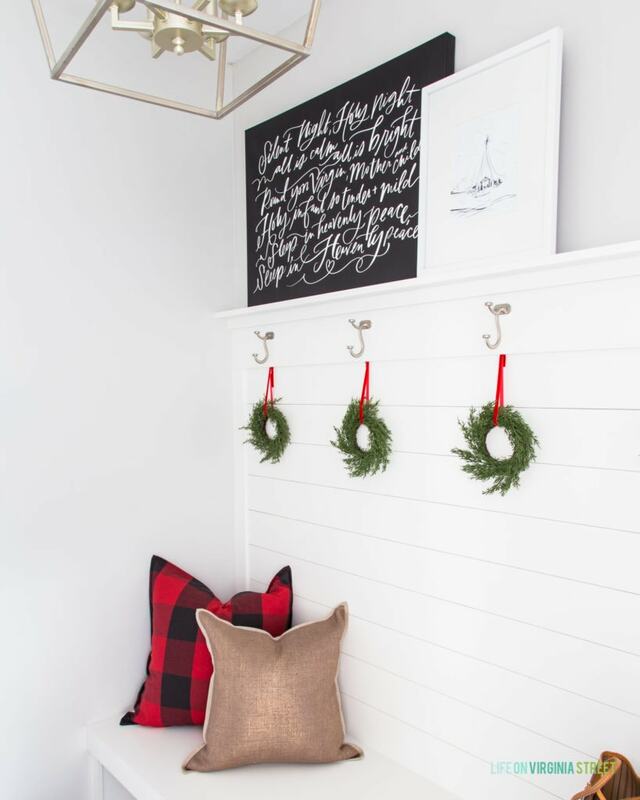 The common decorating denominator in all of our rooms this year is plaid or buffalo check! And it makes me so happy! Let’s get on to the tour. The first stop on today’s tour is our mud room. We were able to get this space much closer to finished this past year (after sitting half finished for 4+ years). It was fun to decorate it for Christmas! Especially since this is the first room we see whenever we come in from the garage. The stars of the show are obviously the Lindsay Letters Silent Night canvas and Nativity Sketch print. I’m so in love with both of them! I used the same small wreaths I used on our kitchen cabinets in here. I hung them under the trim so they are still out of the way when we hang our coats up! They’re also almost like a rubberized material so they don’t get damaged from friction which makes them perfect for this space! I got this buffalo check pillow a few years ago (and I’m so glad it’s back this year!) and paired it with this metallic pillow. Such a fun holiday combination! This next space gets me perhaps the most excited of any in our home this year! 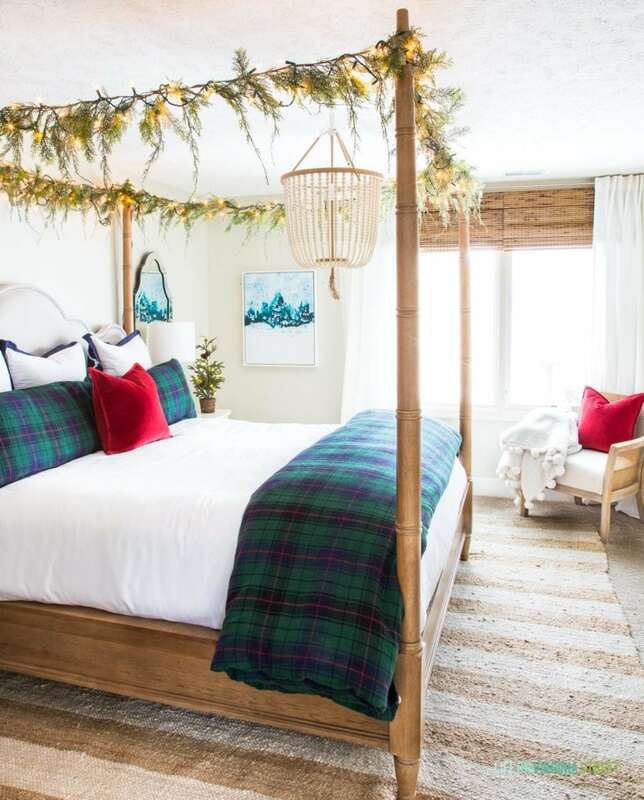 I legit want to move out of our bedroom and into this guest bedroom for the rest of the year! A week or so back, I remembered that the bed came with canopy posts, but we had never used them because we wanted the room to feel more open. Well, I felt like it was time to cozy up the space and add them back on. I’m basically obsessed with the garland and lights I strung from the posts! I’m still so happy with this affordable bead chandelier in the space! 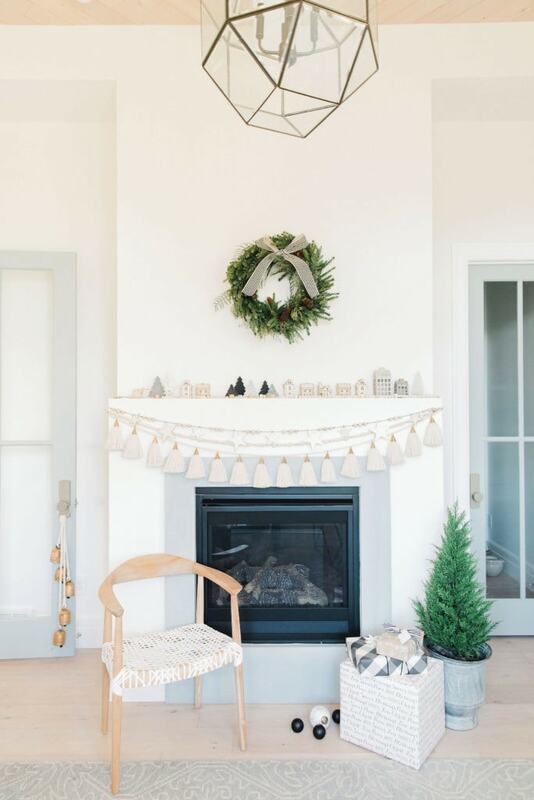 It works perfectly for our normal beachy boho vibe, but also looks great dressed up for the holidays! 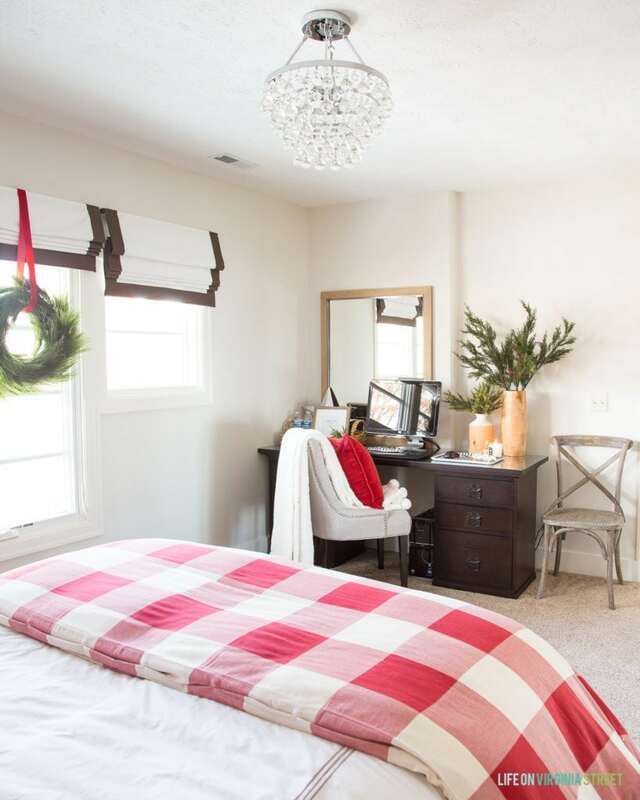 I used the plaid bedding we had in our master bedroom last year. I believe it has since sold out but you can find similar options here. I also love the Solstice Abstract art I added because, not only are the colors beautiful, but it can be used all winter long – not just for Christmas! Add in the the cane chair I got on Black Friday and I’m even more in love! The chair is surprisingly sturdy and good quality (not to mention cute) for the price! And if you don’t already own this cozy pom throw, it’s seriously the softest ever! Our next guest bedroom is our smaller space and bed, but it has seen a lot of use over the past year. So, it seemed fitting to dress it up for Christmas as well! This buffalo check bedding was one of my favorite purchase of the season. 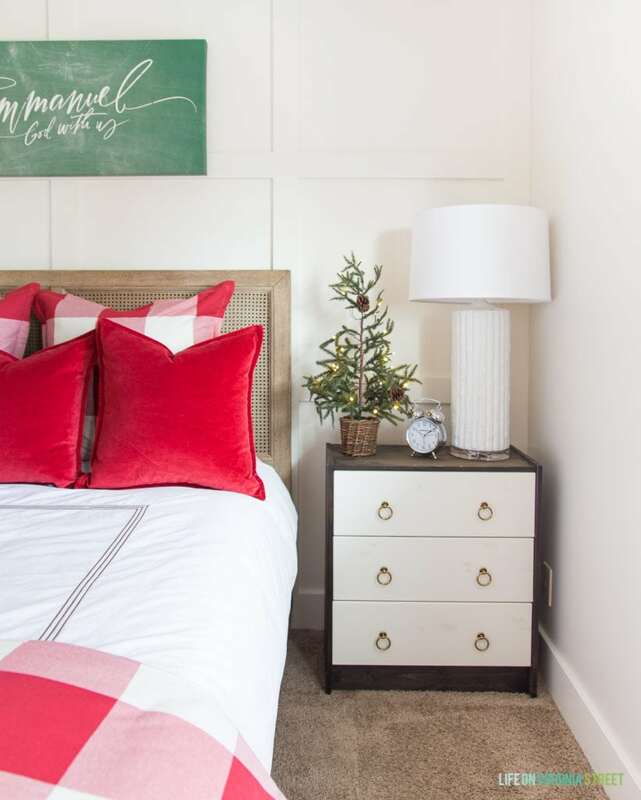 I used this Emmanuel canvas on the wall for a fun vintage vibe, and then added this faux lit pine tree to the nightstand. On the opposite side of the room, we have my old computer along with wi-fi passwords so that our guests can easily get online. You can read more about this space here. 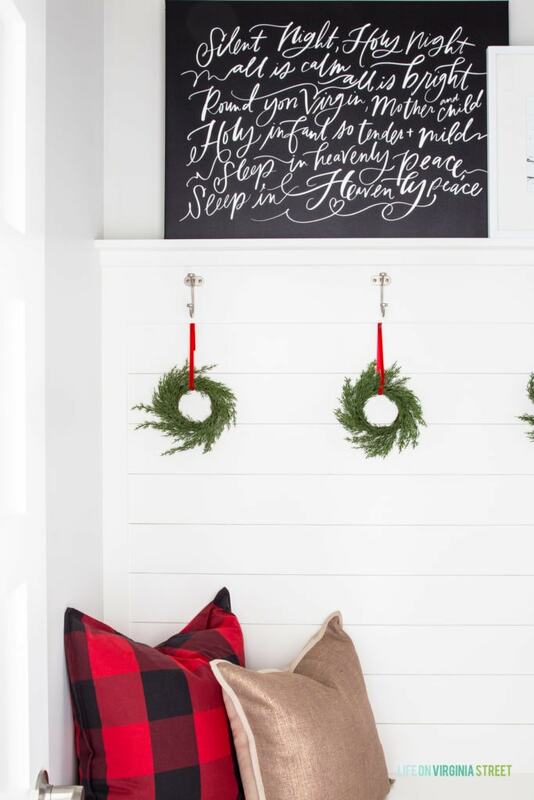 I hope you enjoyed this next installment of our Christmas home tour! 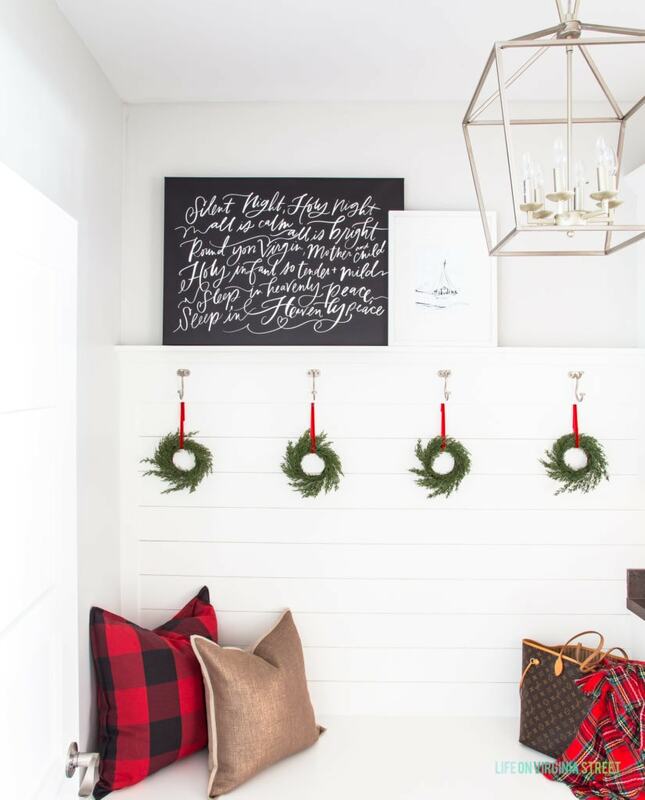 Again, if you missed our first plaid Christmas home tour, be sure to check it out to see our living room, dining room, kitchen and powder bath! 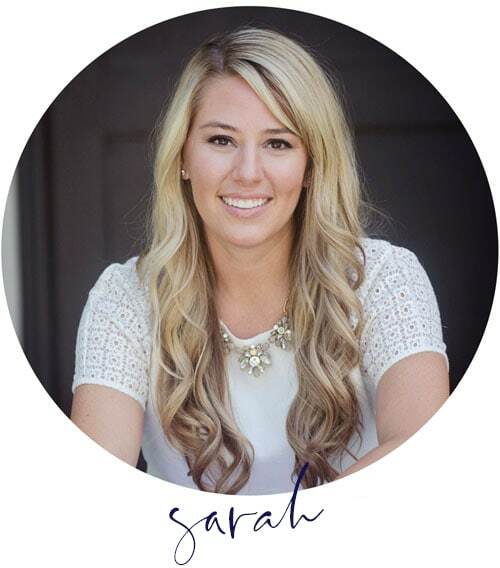 The next stop on the tour is Mollie from Design Loves Detail. 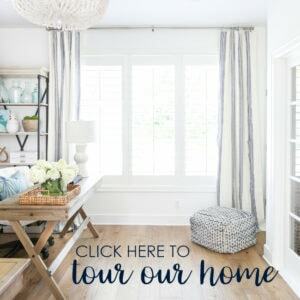 Her home is absolutely stunning and I think you’ll love it just as much as I do! Oh I love the plaid, how fun. So perfect for your home.